Established for almost 20 years, Visual Elements provides award-winning wet and dry hire solutions to live events clients across the world, including music festivals, theatre shows and film premieres. It is also the in-house supplier to leading London events venue, Tobacco Dock, whose diverse client list includes awards ceremonies, corporate conferences and consumer exhibitions. He continues: "It's so quick and easy to programme complex lighting designs, and the Timeline feature enables us to perfectly sync the lighting with audio and video running from timecode." He commented: "I've found it very easy to make the jump to Vista 3. It offers some really nice enhancements which I'm looking forward to fully exploiting in conjunction with the new Vista EX hardware. It's also very pleasing that we can easily migrate a Vista (v)2 show over to Vista 3 if we want to continue to use and further develop it." The new Vista EX control surface provides large amounts of physical control and flexibility within a compact footprint, for even the most demanding of shows. 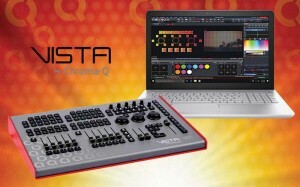 It features 12 customisable playback faders and four function keys which, when combined with the 60 playback buttons, offers up to an incredible 300 user-definable actions per page providing unrivalled control from a unit that is so small.